They say you are what you eat—but apparently, with whom you eat is pretty important too. Current medical research bears this out. But wellness was not what motivated mil-blogger/Navy wife and mom Sarah Smiley to invite one guest every week for 52 weeks to have dinner with herself and her three young sons. Sarah's motivation was to fill a void in her family life: that empty chair at the dining room table while her Navy pilot husband, Dustin, was deployed overseas for a year. But what started as a gesture meant to distract the boys from missing their Dad became a joyous journey as the unlikeliest people accepted the invitations... and brought dessert. The Smiley family discovered that a surprising number of people really are available for dinner. You just have to ask. Each dinner guest taught them about life, and the importance of sharing something simple and intimate—like a meal—to cement these valuable lessons in place. From a state senator (she baked brownies) to sports superstars (ice cream), from the boys' teachers (cookies) to their 94-year old neighbor—with R2-D2 making a very special visit—each Smiley dinner guest leaves an indelible impression. Throughout the book, Sarah Smiley's unvarnished detailing of the emotional ebb and flow of being a "single mom" to three irrepressible boys while trying to balance career, car pool and dinner prep is Bombeck-esque at times, deeply moving at others. DINNER WITH THE SMILEYS transformed the family, so much so that even upon Dad's return home, the dinners have continued... one new guest every week. 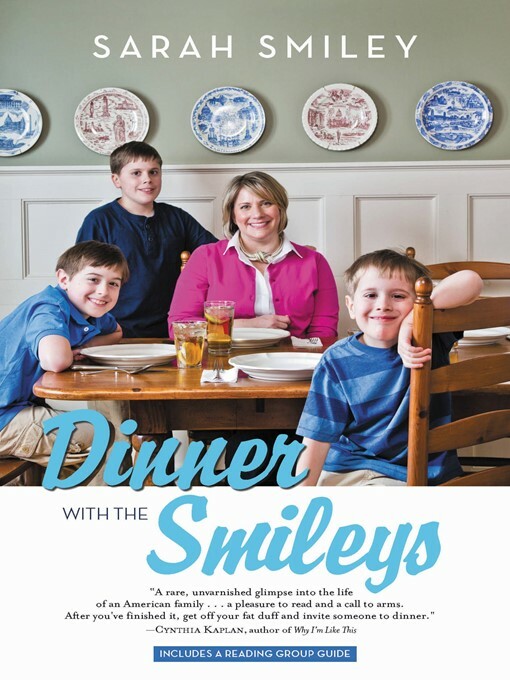 DINNER WITH THE SMILEYS shows how one family made a difference not only in their own lives, but the life of each guest as well. Full of humor and heart, this memoir will remind readers how nice it is to sit down, break bread, and connect, as well as surely inspire many invitations to the dinner table.